1. Listen and mark (rising intonation) or (falling intonation). Lắng nghe và đánh dấu (tăng ngữ điệu) hoặc (giảm ngữ điệu). 1.How long have you been learning English? 2. A: Rising temperatures could lead to the extinction of polar bears. B: The extinction of polar bears? 3.Can you talk about the effects of climate change? 4.Why do you want to study in the UK? 5.A: Would you like to visit Ha Long Bay or Cue Phuong National Park? 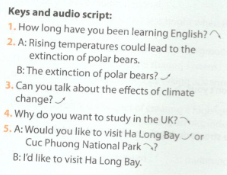 B: I’d like to visit Ha Long Bay. 2. Use the correct form of the words in brackets to complete the sentences. Sử dụng đúng dạng của các từ trong ngoặc đơn để hoàn thành các câu. 3. Put the verbs in brackets into perfect gerunds or perfect participles. Đặt các động từ trong ngoặc vào động danh từ hoàn thành hay phân từ hoàn thành. Three students were suspected of________ (cheat) during the examination. ________(fail) twice, Nam didn’t want to try again. I denied________(make) any private calls on the office phone, but my boss didn’t believe me. He could not recall ________(see) the traffic accident. ________(read) the instructions carefully, he started to install the application. 4. Choose the best answer to complete each sentence by circling A, B, C, or D.
Chọn câu trả lời tốt nhất để hoàn thành mỗi câu bằng cách khoanh tròn A, B, C, hoặc D.
5. Read and complete the text with the words from the box. Đọc và hoàn thành văn bản bằng những từ trong hộp. Open Universities Australia, an online higher education organisation, is run by seven universities. It offers Australian and (1) ________students the opportunity to study academic subjects and (2) ________ modules at their own pace, and in their own time. The units of study and the (3) ________ students achieve are identical to those awarded to on-campus students. Open Universities Australia offers: bridging and short courses, vocational education and training modules and courses, university (4) ________ units, postgraduate units and courses, and a library service. As Open Universities Australia has no entry (5) ________or limits on places, it offers students the flexibility to study at home in any or all of four study periods each year, starting in March, June, September, and December. 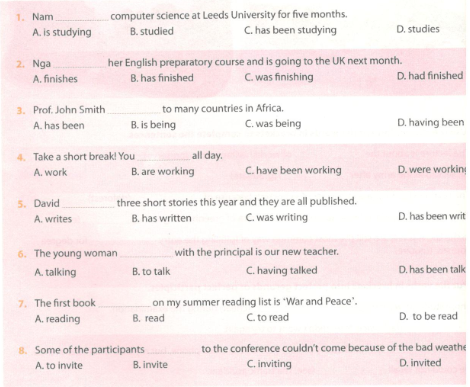 6 Read the text and complete the sentences below, using no more than four words. Đọc văn bản và hoàn thành các câu dưới đây, sử dụng không quá bốn từ. Melting of sea ice in the Arctic has reduced the population size of polar bears and threatens the species with extinction. Scientists say that the earlier annual break-up of sea ice caused by climate change is cutting short the hunting season for the bears, which depend on floating banks of ice to reach their prey. Lack of sea ice in spring and summer is forcing the hungry polar bears to spend longer on land. This gives a false impression that their numbers are increasing as they encroach on human settlements to search for food. Female polar bears depend on the spring hunting season in order to build the fat reserves needed to see them through the summer months. But the ice is disappearing, which means that the bears have not had time to build up normal levels of fat. Since female bears become thinner, they are easily affected by disease. Their ability to reproduce and the survival chances of their cubs decline significantly. The sea ice provides polar bears with a hunting ground, from which the bears can reach their prey – wild seals and other marine mammals. Scientists are worried that if the sea ice season continues to get shorter, polar bears will not be able :: spend enough time on the ice to hunt and feed themselves. 1. According to scientists, polar ice is melting because of……………………………. 2. Polar bears are getting closer to where people live in order to …………………………… . 3. When female bears cannot build up fat reserves, they are ………………………….. .
4. Polar bears need ……………………….to catch seals and other marine mammals for food. 5 If the sea ice season ………………………. polar bears will not have enough time for hunting and feeding themselves. 7. Listen to the recording about Niagara Falls and choose the correct answer A, B, C, or D.
Nghe đoạn ghi âm về Niagara Falls và chọn đáp án đúng A, B, C, hoặc D.
1. Which of the following is on the United States the border with Canada? 4. Where can tourists view the falls? Niagara Falls is one of the most spectacular natural wonders of the world. It is located on the Niagara River along the border between two countries: the United States and Canada. Niagara Falls actually consists of three falls. The American Falls lie on the United States side of the border, in the state of New York. The Horseshoe Falls lie mainly on the Canadian side. The Bridal Veil Falls, which are the smallest, are also on the American side. It is estimated that 85% of the water in Niagara River flows over the Horseshoes Falls, which are the most impressive of the three waterfalls. Each year about 10 million people visit the falls, mainly in the summer tourist season. Visitors can take a boat ride right up to the edge of the falls or view them from the parks on both sides of the river. There are many other attractions for visitors; they can enjoy the wildflowers and trees in the beautiful Botanical Gardens, visit the Niagara Falls Farmers Market or History Museum, or explore the lakes or hiking trails in the area. 8. Write an email to Ms Wilson, an admission officer at Riverside Institute of Education in Californie USA, requesting more information about their computer science programme. You can ask aboul entry requirements, accommodation and fees, using the following outline or your own ideas. Viết một email cho Ms Wilson, một nhân viên tuyển sinh tại Riverside Institute of Education ở Californie USA, yêu cầu thêm thông tin về chương trình khoa học máy tính của họ. Bạn có thể hỏi về yêu cầu nhập học, chỗ ở và lệ phí, sử dụng dàn ý sau đây hoặc ý tưởng của riêng bạn. I am writing to ask for more information about the bachelor of computer science programme at Riverside Institute of Education. I am going to complete upper-secondary school this year and I plan to pursue higher education in the USA. I think a first degree from an American university will improve my future job prospects. After graduation, I would like to get a job related to computer science and develop my career in this field. Actually, maths, IT, and English are my best subjects at school. Your institute offers the best curriculum of computer science, and it is my first choice. Before I submit my application, I would like to ask you a few questions. First, what are the entry requirements for international students? Are there any entrance examinations that I have to take? And what kind of enrolment form do I have to complete? Second, what types of accommodation are available for international students at your institute? Could you also advise on the living costs? Finally, I would like to know more about the tuition fees. How much do I have to pay for my studies per semester or year?